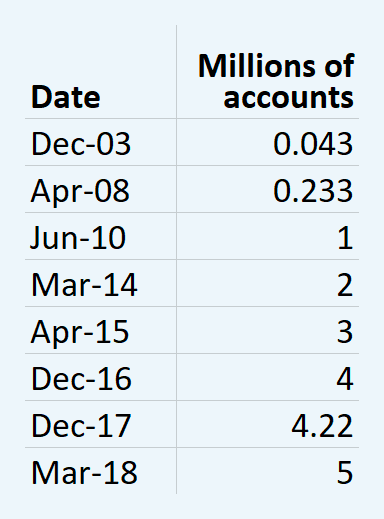 Active mobile accountsCubans now have 5 million mobile accounts. The five-millionth account was recently opened Guanabacoa, in the eastern part of Havana and we see here that growth slowed last year, but has resumed — perhaps due to increased 3G availability. Most Cubans have 2G phones, which are used primarily for making calls and sending text messages that may have attached images. As of June 2017, there were 856 2G base stations, covering 75% of Cuban territory and 85% of the population. Cuba is rolling out 3G connectivity, and ETECSA reports that 47% of the population is now covered and, as of last June, there was some coverage in all provincial capitals and tourist resorts. The only speed data I have seen was gathered by Armando Camacho who ran a number of 3G speed tests in Havana (near the corner of Patrocinio and 10 de Octubre) and observed ping time to a server in Miami as ranging from 91 to 127 milliseconds, upload speed from .48 to 1.58 Mbps and download speed from .85 to 10.42 Mbps. The latter is fast enough to allow Web browsing and other applications, particularly those like YouTube Go, which are designed for use over slow, expensive connections in conjunction with offline SD-card storage. Armando observed considerable speed variance, suggesting that others were sharing the same radio or backhaul resources and performance would be frustrating at times. (Have others run similar tests)? I don't have any statistics, but many Cuban phones are incompatible with ETECSA's 3G service, so users will be stuck with 2G until they get new 3G phones. Upgrading to 3G technology when 4G is common in many nations and 5G is close on the horizon may sound discouraging, but it makes sense as a stopgap strategy for Cuba since it keeps backhaul load down and phones are cheap. That being said, I hope they are evaluating the possibility of leapfrogging to 5G technology when it matures, and they can afford it. Local Time: Wednesday, April 24, 2019 01:13 PM PDT – Page Load: 0.3021 Sec.